Everyone can hear this guy coming. Everyone. Here’s the thing people who don’t own a Toyota wouldn’t know: when they’re race prepped they’re a blast to drive. 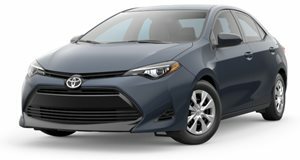 Yes, this even applies to the Corolla, perhaps one of the most boring cars to have ever existed. But with the right tuning and engine modifications, even a Corolla can become an entirely different animal. Matt Farah recently caught up with the owner of a 2003 Corolla that was originally purchased solely as a parts car for a Pontiac Vibe, sister ship to the also discontinued Toyota Matrix. Turns out the Corolla was way more fun to drive than originally thought, so its owner sort of just kept it, and soon began the modifications. This is where things get interesting. Thanks to a TRD Supercharger, this thing now makes around 200 wheel horsepower. It also has a limited-slip differential and light flywheel, race-spec clutch, completely stripped-out interior, and a race seat locked in position. Of course the suspension also received some surgery, now featuring control arms, coil overs, sway bar and end links. The combined outcome definitely makes this conservative looking ’03 Corolla a sleeper – when it’s shut off. The moment pressure hits the accelerator, things get loud. Very loud.